Once you’ve shopped the best spotting scopes under $1,000 and tested a few, it becomes abundantly apparent that the mantra “you get what you pay for” has its limitations when it comes to comparing going rates for sporting optics. After all, $1,000 is no low ceiling, objectively speaking – pun not intended. However, there are indeed a good many scopes that would put a good many consumers to a choice between paying cash for a quality used car and a premium new piece of field equipment. Nikon Prostaff 5 Fieldscope. Nikon deserves extra points just for the consideration of building in a sliding sunshade. Seriously, that’s a nice touch it’s a wonder more manufacturers don’t adopt. As for the scope itself, the internal surface coating on the lenses will minimize light lost to reflection even in the harshest brightness. Expect virtually no image loss at low light, thanks to a nearly perfected nitrogen-purge moisture-proofing process. I say “almost” because the Prostaff 5 is prone to light fogging that clears quickly without any lingering issues in extreme cold. The exterior waterproofing, on the other hand, is absolutely flawless. Vortex Optics RZR-50A1 Razor HD Spotting Scope. Vortex certainly didn’t skimp on materials when building this particular Razor HD spotting scope. The premium HD glass with XR anti-reflective coating and excellently calibrated fine focus adjustments refine color quality and clarity to the point that I could spot trace from my shots in a full range of lighting and overall shooting conditions. Bushnell Elite Porro Prism Spotting Scope. For my money, nothing has or will decisively top Bushnell clarity. Even Vortex’s HD glass can’t exceed the brilliant, sharply contrasted color resolution of the Elite Porro Prism’s ED Prime fluoride glass. I have always highly appreciated Bushnell’s commitment to fully multi-coating its lenses for optimal performance paired with BaK-4 porro prisms. Along with its famously infallible fog-proofing and waterproofing, Bushnell adds its premiere Rain Guard HD water-repellent lens coating to reduce droplets to inconsequential microscopic specks on contact. Bushnell Elite Porro Prism Spotting Scope. Far be it for me to have anything negative to say about Bushnell’s storied quality testing or their optics’ notoriously unbeatable resistance to moisture. I just have one complaint: at 17 inches and heavy as a brick, this is far and away the most cumbersome, restrictively heavy scope of the trio. That’s one massive knock. I would have a hard time justifying the purchase of a spotting scope that’s too heavy and long for me to effortlessly take it a number of the places I would want to put it to use. Nikon Prostaff 5 Fieldscope. There’s nothing really wrong with the Prostaff 5’s build. It’s more that it “could be better” with just a bit of refinement. I’ve already addressed the somewhat disconcerting issue with interior fogging, inconsequential as it proved to be. However, at 14 ⅞ inches in length, it is certainly more awkward to cart around inside a pack afield than Vortex’s Razor HD. It would have been nice for the magnification knob to include a “speed bump” for more accurate adjustments on the fly, but I could hardly call that a drawback. Its waterproofing may be rated for 1 meter up to 10 minutes. However, don’t be fooled for a moment. Tests have left this scope outside in downpours over four hours without so much as a molecule of moisture seeping inside. Vortex Optics RZR-50A1 Razor HD Spotting Scope. Vortex has staked a substantial portion of their brand’s growing reputation for quality on an obsession with the sturdiest materials assembled in the strongest possible fashion. The RZR-50A1 is astoundingly portable at 10.3 inches long and weighing in under 2 pounds with a rubber-armored straight tube of phenomenally tough aluminum – a single, nearly indestructible piece. Even if it had a significant structural weakness, this tough little bugger is covered under a comprehensive VIP warranty. Practically speaking, its 45-degree eyepiece is notably more comfortable especially atop a tripod and makes for unmatched easy coarse and fine adjustments with the smooth-rotating magnification controls while peering through the lens. Vortex Optics RZR-50A1 Razor HD Spotting Scope. This is where the RZR-50A1 falls furthest back from its two competitors. By the numbers alone, it boasts only 11-33x magnification with a diminutive 50mm objective – one of the consequences of its purposely compact design. Still, the quality is certainly up to Vortex’s lofty standards. The triple apochromatic lens system eliminates diluted color fidelity and degraded resolution at (relatively) high magnifications, even past 2,500 yards. It just happens that this scope’s “high” magnifications are the middle of the other two scopes’ powers. Nikon Prostaff 5 Fieldscope. The Nikon Prostaff 5 stands out in this regard thanks to a feature that restricted the appeal of its construction: not many other spotting scopes at this price point offer an impressively upsized 82mm objective lens. When you combine that with standard 20-60x magnification, you get bright, high-contrast images across its full range. Unfortunately, there’s also a drawback of softened focus at maximum magnification but its fine adjustments mitigate that flaw in appropriately simple fashion. Bushnell Elite Porro Prism Spotting Scope. 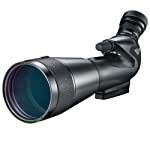 Bushnell, as usual, offers faultless magnification with standard 20-60x power and an 80mm lens. Views are perfectly clear with edge-to-edge detail past 500 yards. I could see bullet holes out to 600 yards. With Bushnell, you always know exactly what to expect. There isn’t much you could ask of this scope that it couldn’t deliver in immaculate quality. Vortex Optics RZR-50A1 Razor HD Spotting Scope. I can’t get over how impressively bright the Razor series’ premium HD glass makes even images seen through the lowest light. The combination of its XR anti-reflective coating and the thorough argon purge enables the RZR-50A1 every ray of light that touches it. Nothing goes to waste on glare. Nikon Prostaff 5 Fieldscope. Like many scopes that forego full multi-coating, I marveled that Nikon would skimp on something so simple that improves a scope’s brightness so vastly. I didn’t think it could compete with the substantial lighting of the superbly processed Vortex and Bushnell glass. Then I looked through that oversized 82mm objective lens. It’s just too big not to devour light and pump it cleanly through. Bushnell Elite Porro Prism Spotting Scope. This is where Bushnell will almost always hold an advantage over all but the very highest-quality optics, such as Leica, Swarovski, and Leupold. Even then, I’ve used a number of Bushnell optics that rivaled lower-tier Leupold builds. It was impressive enough when their spotting scopes stood apart with full multi-coating, but then came the Rain Guard HD water-repellent process and even rain suddenly couldn’t impede its light gathering. Bushnell’s perfect balance makes it the best spotting scope under $1,000 by overcoming aspects of the Vortex and Nikon scopes that both set them apart in positive fashion and also hold their respective appeals back. The Vortex milks stunning quality from its size and compensates in some ingenious ways for what its dimensions diminish, such as the size of its lens. Whereas the Nikon is phenomenally durable under torture tests and stunningly bright thanks to its uniquely large objective, I could see where transporting it on foot would quickly become aggravating. Bushnell’s medium-weight build and average objective enabled it to shine based on its outstanding craftsmanship. How to Make a First Aid Kit at Home – It May Save Your Life!